The research, at Washington University School of Medicine in St. Louis, sheds light on one of the leading causes of blindness in industrialized countries and offers potential targets for treating the disease. Apte, the Paul Cibis Distinguished Professor of Ophthalmology and Visual Sciences at the School of Medicine, has spent years studying the immune system in the eye to distinguish changes related to aging from those related to disease. In earlier work, he found that a cell-signaling molecule, called interleukin-10 (IL10), plays a role in the formation of blood vessels involved in the “wet” form of macular degeneration, which is more frequently linked to blindness than the “dry” form of the disease. Before vision loss occurs, IL10 levels increase in the eye, as do the number of specific immune cells, called M2 macrophages. These macrophages are known to contribute to the development of damaging blood vessel growth beneath the retina. Until now, though, how IL10 actually contributed to the proliferation of macrophages and damaging blood vessels wasn’t well understood. So Apte and his colleagues engineered mice in which various cell-signaling pathways were disabled. Those experiments led them to discover that a specific signaling pathway involving a protein called STAT3 was activating and altering immune cells in the eye, and those cells then spurred the formation of harmful blood vessels. Further, they examined eye tissue from patients treated in the 1980s and 1990s, when surgery to remove abnormal blood vessels from underneath the retina was routinely performed on patients with the wet form of macular degeneration. There, too, the same STAT3 protein that was abundant and active in M2 macrophages in mice also was found in high levels in the human tissue. The findings suggest that the causes of damaging blood vessel growth in people are the same as what the researchers had observed in mouse models, Apte said. In both mice and in patients, abnormal blood vessel growth was linked to macrophages with high levels of the active form of STAT3. 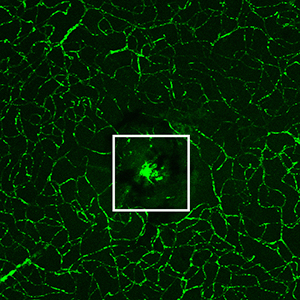 That a cause of significant vision loss appears to be the same in mice and people is good news, Apte explained, because some compounds can disrupt the actions of STAT3 in mice and keep the pathway from spurring blood vessel growth. Those same compounds may alter the course of macular degeneration in people with the condition. “Now that we have a better idea of how these macrophages are activated at the molecular level, we may be able to use those drugs to halt or reverse the disease process,” Apte said.